This page may grow into something more some day, but for now it's just a gallery for my "Wall o' Fist" at the back of my office. 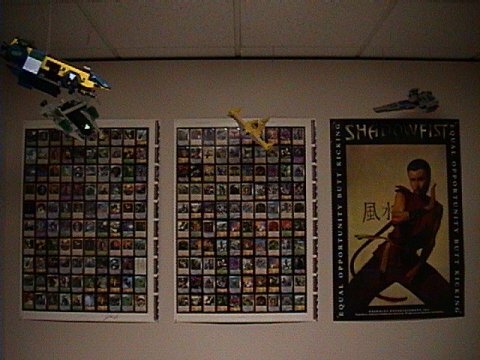 On the left is a Flashpoint Rare/Uncommon sheet, in the middle is a Flashpoint Common sheet, and you probably recognize that poster on the right. On a related note, I'm always in the market to expand the Wall. If you know where I can find Limited, Standard, or Netherworld sheets, please let me know. I have plenty of trade stock and FP sheets, and I'd be willing to spend cash if that's what it takes. Oh- and just ignore those Lego ships hanging from the ceiling. That's where another of my hobbies is encroaching on the Wall.